A simple blood test has been developed that can diagnose cancer in just ten minutes. It spots tiny amounts of DNA floating through vessels that could only have come from tumours – and not healthy cells. The breakthrough could lead to much earlier detection and more chance of a cure – with treatment beginning even years before symptoms develop. It is hoped it will eventually be performed at the same time as routine blood tests, such as a cholesterol check – even using a mobile phone app. Corresponding author Professor Matt Trau, of the University of Queensland, Brisbane, reckons it may be the ‘Holy Grail’ of cancer diagnostics. If you think of a cell as a hard-drive, then the new findings suggest the disease needs certain genetic programmes, or ‘apps’, in order to run. Explained Prof Trau: “It seems to be a general feature for all cancer. It’s a startling discovery. In experiments it distinguished tumours from healthy cells with up to 90 per cent accuracy. The technique can also be used on tissue biopsies. Blood tests are sometimes ordered to help doctors diagnose cancer, but different ones are required depending on the type suspected. And they are not definitive, but one step in the process. An MRI scan is the most often used method, but it tends to miss small tumours – only working to confirm a diagnosis when it is often too late to start treatment. About nine in ten cancer deaths involve a diagnosis that came too late. So the Australian team’s breakthrough paves the way to saving countless lives. The test described in Nature Communications exploits the differences between the DNA in cancerous and healthy cells to allow for a quick, early diagnosis. It is based on a process known as epigenetics – the attachment of a chemical tag known as a methyl group to DNA. This alters how DNA can be read, switching genes on or off. So the researchers focused on DNA that circulates in the bloodstream after cancer cells die and release their cargo. 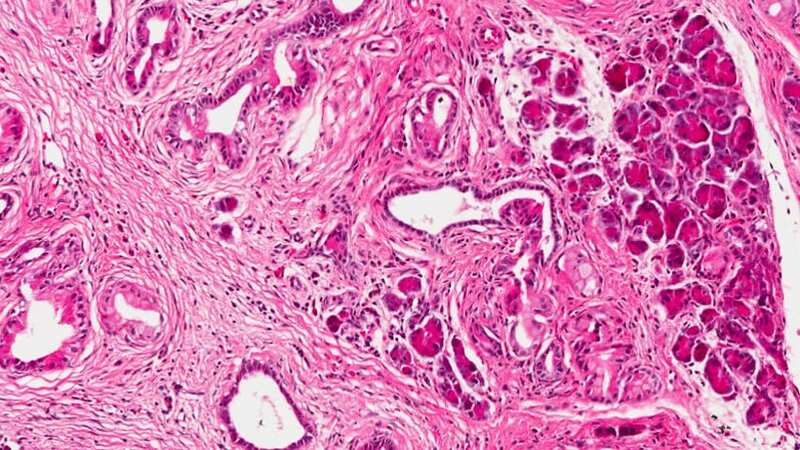 They discovered cancer cells’ genome is essentially barren except for intense clusters of methyl groups at very specific locations – instead of being spread evenly like in normal cells. The researchers have dubbed it the cancer “methylscape” – for methylation landscape. It appeared in every type of breast cancer they examined and other forms of the disease too including prostate and bowel cancer, as well as the blood cancer lymphoma. Taking advantage of this, the researchers designed a test which uses gold nanoparticles. These instantly change colour depending on whether or not the 3D nanostructures of cancer DNA are present. So far they’ve tested the new technology on 200 samples across different types of human cancers, and healthy cells. Dr Sina said: “It works for tissue derived genomic DNA and blood derived circulating free DNA. Although not yet perfect yet, the researchers said it is a promising start and will only get better with time. It will be some years before it can be used in the clinic. Added Prof Trau: “We certainly don’t know yet whether it’s the Holy Grail or not for all cancer diagnostics.